Allergan PLC announced plans Tuesday to streamline its executive team under Chief Executive Brent Saunders and buy back up to $10 billion in stock as the drugmaker reported sales that fell short of analysts’ expectations. Wall Street should read the share repurchases as a signal that Allergan won’t pursue the kinds of big deals, such as the $70.5 billion transaction with Actavis PLC in March 2015, that the company had become known for lately. “When we look at the universe of things to buy, we don’t see anything that is a better investment than our own equity,” Mr. Saunders said in an interview. Allergan will instead focus, he said, on managing its current portfolio of products, realizing the potential of its pipeline of promising drugs and small, so-called tuck-in deals to supplement its current areas of focus. For the first quarter, Allergan said revenue rose 48% to $3.8 billion compared with the same period a year earlier, during which the Actavis deal closed. Sales were driven by flagship products such as anti-wrinkle treatment Botox and growth of some newer drugs like irritable-bowel therapy Linzess. Analysts had expected revenue of $3.95 billion. Mr. Saunders attributed the miss to one-time events, such as its drug distribution unit’s expected loss of Target Corp.’s pharmacy business. Revenue from the company's Anda distribution business, which supplies mostly generic pharmaceutical products and over-the-counter medicines, fell to $364.7 million from $554.3 million, hurt by the loss of the Target business. 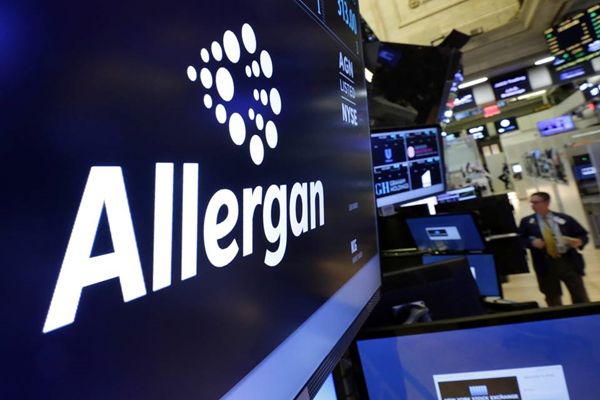 The performance report was the first for Dublin-based Allergan since its planned $150 billion union with Pfizer Inc., of New York City, was called off last month, after the Obama administration issued rules designed to stymie such tax-lowering inversion deals. Meanwhile, Teva Pharmaceutical Industries Ltd. is moving ahead with plans to buy Allergan’s generic drugs business for $40.5 billion, which would effectively wipe away Allergan’s debt. The companies expect the deal to close by the end of June. In preparation, Allergan announced a new leadership structure. Bill Meury, who has been overseeing Allergan’s branded drug sales, becomes chief commercial officer, while supply-chain executive Bob Stewart moves to become chief operating officer. Once the Teva deal closes, Allergan would begin the share buybacks, Mr. Saunders said. The company plans $4 billion to $5 billion in stock repurchases within the first four to six months after the Teva transaction is completed. The company had a total market value of about $84.4 billion as of Monday’s market close. For the quarter, Allergan’s profit was $255.7 million, compared with a loss of $512.7 million during the same period a year earlier. Earnings per share were 47 cents, compared with a loss of $1.85 a year earlier. Adjusted earnings per share were $3.04, above analysts’ forecasts of $3.01 a share, according to Thomson Reuters. Specialty pharmaceutical companies like Allergan have been shadowed by concerns about their prospects recently. The doubts were triggered by scrutiny of Valeant Pharmaceuticals International Inc.’s practices, and were re-stoked after Endo International PLC lowered its guidance last week. Mr. Saunders said he hoped investors recognize that each company is different and Allergan is built on quality, fast-growing assets and smart investments in drug development.